Mike Rawlins, founder of the Stoke-based political hyperlocal site Pits n Pots spoke at the regional Society of Editors meeting today, on the site’s origins and where it plans to move to in the future. Born out of a desire to “see the city improve”, Rawlins argued that the site aimed to cater for a what he felt was a need for more discussion around local politics, adding that the site’s highly active comment threads today are like a “a proper good pub discussion”. As Pits n Pots is run by enthusiasts, rather than journalists, it focusses on providing the information, and allows the community to read into it. Not editing interviews also minimises the need for technical expertise. The site has seen a rapid growth in traffic, moving from around 1,900 unique visitors a day, with 6,000 pageviews in December 2009, up to approximately 12,000 unique visitors and 30,000 pageviews a day in April and May of 2011 as the site provided far more comprehensive coverage of the local elections than the local press. Other successes for the site include providing live coverage of a Stoke on Trent EDL rally, and posting videos from their coverage of the day which resulted in them being the 2nd highest news channel on YouTube globally for two days. Now supported by the Journalism Foundation, April 2012 saw Pits n Pots attempt a print format, produced by the journalism students at Staffordshire University, printing 50,000 copies. Journalism.co.uk reported that this one-off print edition, which was created as a marketing tool, helped to double Pits n Pots web traffic. Rawlins says that the site will never be a full time job for him, but he hopes to employ a journalist in the future to progress the site, to facilitate better use of data, more investigative content, and allow better scrutiny of the local council. He concluded that hyperlocal sites like Pits n Pots would never replace the local paper, and that they can coexist. This entry was posted in Hyperlocal, Traffic and tagged Hyperlocal, Mike Rawlins, pits 'n' pots, political news, Society of Editors on May 10, 2012 by Jonathan Frost. 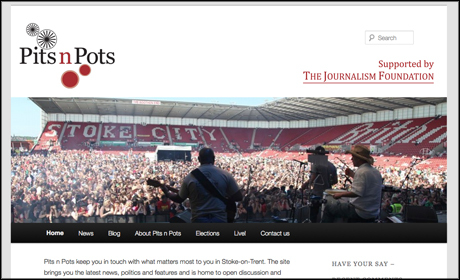 Independent news site for Staffordshire (featured in this Journalism.co.u interview with founder Matthew Taylor) has merged with neighbouring local news site Pits ‘n’ Pots to offer more multimedia coverage. “But with the combination of skills we now have through the amalgamation – the broadcast, photography and technical abilities of the other partners, tied with my print journalism – we have a real opportunity now to create a genuine alternative news site for Stoke-on-Trent. The new site aims to attract around 3,000 unique visitors per day generating around 10,000 page views, according to a release. This entry was posted in Online Journalism and tagged genuine alternative news site, Journalism.co.uk, local news site, Matthew Taylor, news site, Pits, pits 'n' pots, Radical Press, Stoke-on-Trent on March 23, 2009 by Laura Oliver.